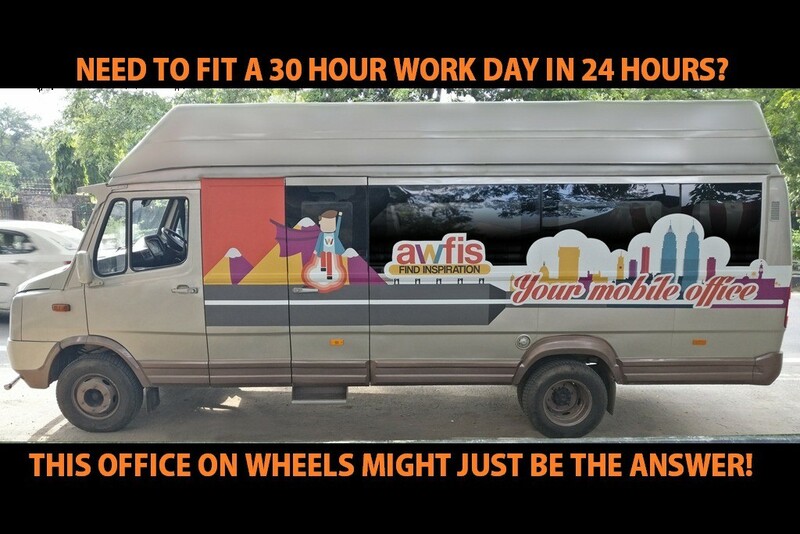 Awfis is literally helping you drive your Startup with a workspace on wheels! AWFIS began its journey just 18 months ago when they set out to deliver just-in-time availability of office space for Startups and SMEs. Driven through their technology platform, AWFIS has managed to set up over 20 centres across India and has over 4500 seats available to its community members and currently runs at a 90 per cent occupancy. Over this period, AWFIS has managed to deliver a platform that is more than just about having a desk to work at. They have forged strategic alliances with close to 70 partners which include Amazon and PayTm plus there are other fun alliances with Hard Rock Café and Faasos that offer discounts to those who use the coworking space. Apart from that AWFIS also organizes events where they invite speakers to come in and share their experiences or offer tips and tricks to the Startups present. By doing all of this, AWFIS has managed to create an environment that goes beyond just renting a desk and getting a free cup of coffee and Wi-Fi. They offer an atmosphere that is designed to help businesses grow and for this reason it comes as no surprise that they are currently the biggest player in this space. While AWFIS is working on expanding their reach and bring a location closer to home for many in order to reduce travel time and make life more convenient, the company is also embarking on a unique new journey that involves a travelling office! On that note, we at MotorScribes got in touch with Mr Amit Ramani – the Founder and CEO of AWFIS Space Solutions Ltd.
MotorScribes: Before we get talking about your unique office proposition on wheels, we recently heard about WeWork announcing their entry to the market. They are the largest global player in this space and do they pose a threat to your business? Amit: We have already made a mark for ourselves in this domain and by having an international company come in and set up shop in India; it only validates the fact that our idea was great. There is a lot of scope to grow and from what WeWork has announced, they intend on having extremely large coworking spaces in major cities. By the time they are set up, we would have expanded our reach to over 60 centres. Moreover, our business models differ slightly. They believe in having a centralized location; however we are of the firm belief that to genuinely cater to the Startup ecosystem we need to offer locations that are closer to home. Not only is it more convenient, it also reduces the time wasted while commuting. MotorScribes: Speaking of commuting, this brings us to why we are interested in your latest pilot project – an office on wheels. Amit: The aim with our Office on Wheels is to create a property that allows people to be more productive on the go. While our core business remains coworking spaces, Office on Wheels is a layer of innovation that we thought could be a massive value-add to those customers who wish to capitalize on the time they spend commuting as well. It is in a test phase right now, however the demand has been good and we are positive that this segment also has potential. MotorScribes: Can you elaborate on the product? Amit: Currently we are running a Force Motors Tempo van that has been fully customized into an office. It has on board Wi-Fi, a working area for up to eight people, a printer, LED screens, a small pantry and an inbuilt toilet as well. Basically, all the amenities that you would like to have in your office can be found on board our mobile work place. While that is our first model, we are also working on two more concepts for our Office on Wheels fleet. This includes a Toyota Innova customized for four people as well as a Volvo Bus which we believe will cater to larger corporates as well. MotorScribes: So, how does all this work? Amit: Currently the booking of the Office on Wheels can only be done through our App. We have a number of packages that a customer can choose from and we have also ensured that the vehicle has a National Permit should a customer feel the need to travel outstation with their office handy! MotorScribes: What are your expansion plans for Office on Wheels? Amit: Currently, Office on Wheels is in a test phase and we are seeing demand in the Delhi-NCR region. Once we have complete feedback on this, we intend on rolling out our expansion plans in April this year (2017). We intend on offering this service in multiple cities as we grow our reach.